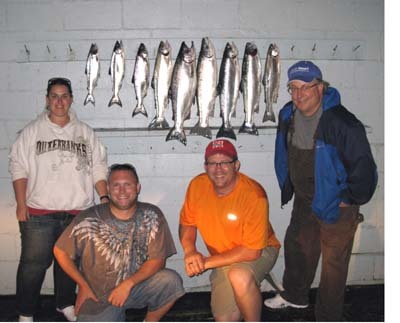 We fished PM Lake and the Ludington harbor area the last two days. We had several bites yesterday by the Coast Guard Station. Most of our action today was in the south end of PM Lake. Our 3 Kings came in that area. Two of them were on 10″ Spin Doctors and Big Water Meat Rigs. One was on a high wire diver out 45 ft. on a 10 ” White Crush Spin Doctor/Green Mile Meat Rig and the other was on a 5 color core with a 10″ Kevin’s Girlfriend Spin Doctor/Green Mile Meat Rig. The other King came on a Green Black Ladder Back Captains Choice Cut Plug down 10 ft. on an out down. We took a nice Steelhead between the pier heads on a 1 color core with a Yeck Wart frog and the 2 Browns came on glow spoons on 3 color cores. The Sheep Head took a Green Jeans on a 3 color core. A morning storm prevented us from going out this A.M. so we rescheduled the trip for the afternoon. We headed out southwest of Ludington and set up in 180 feet of water (fow). We trolled out to 420 fow and then back in to 180. We had 14 bites and landed 9 of them. Our hot rod was an out down set at 60 feet with a pair of regular size Fuzzy Bear Yellow Tail spoons. We took our biggest Steelhead on a mag size Fuzzy Bear Yellow Tail on a 300 copper. The surface temp was 68 degrees, but that didn’t stop a Steelhead from hitting a Super Slim Steelie Dan on a 3 color core. We hit two fish on high divers out 110 & 120 with Monkey Shine Super Slims.